I have seen firsthand what “dialogue” means to some – you do not talk, you only talk on our terms, you listen to us and don’t talk, and if you are allowed to talk, you can only say what we want to hear. So now the government wants a formalised interfaith dialogue mechanism? Going by the history of the state’s response to civil society’s attempts to initiate interfaith dialogue, I am not holding my breath. In 2005, various members of civil society had a conference proposing a statutory Interfaith Commission (IFC) for Malaysia. A small number of Islamist non-governmental organisations (NGOs), claiming to speak for “mainstream” Islam, succeeded in derailing the initiative when the government pandered to their scare tactics and “shelved” the proposal. Noteworthy was the fact that those NGOs refused to participate in the conference, and set various ground rules that essentially sought to bar the participation of certain individuals and censor the discussion. Furthermore, the mention of international human rights conventions in the IFC’s draft statute became an excuse to insinuate that the entire initiative was an attempt to interfere with Islam and allow Muslims to apostasise. The objections and methodology then were a prescient sign of other obstructionist tactics these NGOs have since taken. Shortly after the aborted IFC initiative, a separate initiative by a coalition of NGOs called “Article 11” was again derailed. That coalition came about because of the injustice caused to S. Shamala, the Hindu mother fighting a custody battle over her children with her estranged husband who had converted to Islam. The injustice was in court decisions which purported to legitimise the conversion to Islam of the infant children without Shamala’s consent. In a decision the Malaysian Consultative Council of Buddhism, Christianity, Hinduism, Sikhism and Taoism (MCCBCHST) called Pyrrhic, she was given custody of her children but was prevented from “exposing” them to her religion. Yet, the Islamist NGOs took to the streets and disrupted closed door forums that the Article 11 coalition organised throughout the country. Forums in Penang and Johor Baru were disrupted – in Penang, the mob outside rushed into the meeting room and disrupted the forum. In JB, the police allowed the mob to come right to the doorstep of the hotel and no further. Then, instead of dispersing the crowd the police “advised” the Article 11 organisers to stop the forum. Obviously, the freedom of association and expression of the mob outside trumped the freedom of those inside to discuss issues of public interest. I was filming the protestors at JB in early 2006. They were not violent, and were protesting vigorously. True, the police need not have allowed them to block access to the hotel. But, I suppose the hotel needed to be shown what happened if they failed to find a reason to cancel irritating forums such as these. The point is this – there was no change in the mob protesting from the time they arrived at 9am until the time the forum was halted at 10am. What then precipitated the move by the police to halt the forum? Then, in 2008 I was sitting inside the Bar Council auditorium where I was a speaker in a forum on the problems faced by non-Muslim families when one spouse converted to Islam. I was there as solicitor for R. Subashini – Mohamed Haniff Khatri Abdulla, counsel for Subashini’s estranged husband, was also a panellist. Yet, again, the same Islamist NGOs were there. Earlier that morning, they had left two bottles looking like Molotov cocktails at the Bar’s premises. Another cocktail, intended for then Bar president Datuk S. Ambiga was instead put into her parents’ old house, which ironically was now the residence of then Umno Wanita deputy head Datuk Seri Shahrizat Abdul Jalil. After protesting for an hour and blocking traffic outside the Bar Council, the mob again entered the premises, walked up to the front and stood in a line blocking the view of the participants. The following 10 minutes were surreal – those of us on the panel were speaking to an audience we could not see because we were blocked by the glares of several visibly upset Malay Malaysian men. The most iconic moment of that fiasco, however, was when former Human Rights Commissioner Professor Dr. Mehrun Siraj tried to reason with the protestors to let the forum continue, saying it was her responsibility as a Muslim to engage and teach non-Muslims about Islam. Her pleas fell on deaf ears, and she was then berated for falling for the trickery of the non-Muslims. Again, the Bar Council’s observers outside confirmed that the participants outside were not being any more difficult than they already were when the police “advised” the Bar Council to halt the forum. Again, no doubt, their right to protest on the streets trumped our right to talk indoors. And so now, when I see some parties calling for the Catholic Church to withdraw their claim to use the word “Allah” to refer to God, I am reminded of these previous incidents. Violence, mob rule and irrational fears are allowed to overrule and undermine the legitimate exercise of fundamental liberties and freedoms by some. The reality is that many Muslims have no problems with the Catholic Church using “Allah” within their own congregation in the exercise of their right of worship. But seeing this, these Islamist probably thought they had to cause exactly the sort of disturbance to public order the court had ruled was not proven to have existed. The plea for inter faith dialogue rings hollow to me. I have seen firsthand what “dialogue” means to some – you do not talk, you only talk on our terms, you listen to us and don’t talk, and if you are allowed to talk, you can only say what we want to hear. If there is no respect; if there is no willingness to understand the other side’s concern; if “living in harmony” means “live according to my dictates”, then there is really no point in “dialogue”. LB: This piece was written for the Nut Graph, and is reproduced here with their kind permission. Posted on 29 January 2010. You can follow any responses to this entry through the RSS 2.0. I am helping to plan an interfaith national day of prayer. 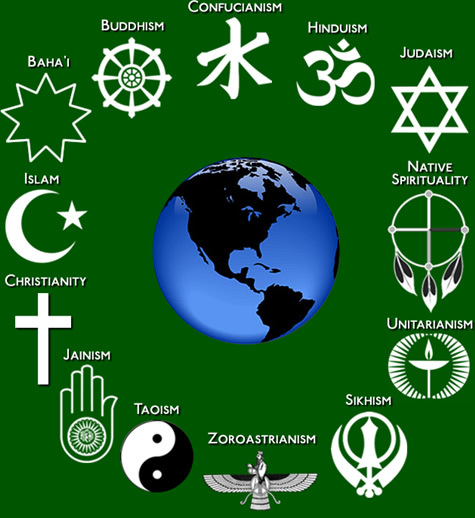 I am wondering if we can use your interfaith graphic? Farish. I have not come across anyone doing that kind of research, but you are right. It is an interesting area, and one someone should look into further. Shan. PS Thanks for stopping by at this little blawg of ours!